By Peter. Last updated Tue 2 Apr 2019 at 8.55pm. At Thirsk's information centre we now have 'Thirsk & Sowerby Street and District maps' at the price of a postcard - 30p - as well as the free Thirsk Guide. If you are visiting for one or two hours the free Thirsk Guide is appropriate - it has a detailed plan of the town centre and shows local paths so you can plot a relaxing stroll. The new Thirsk Street Map enables longer stayers and residents to find almost any street, including in the recently built Sowerby Gateway. If new to the area it will help you find the Garden Centre, Auction Mart, Station and so on. Also included is a District map stretching from the A1(M) junction 49 to Cod Beck Reservoir above Osmotherley. On it you'll find The White Horse, The Mouseman, Shandy Hall and the interconnections between the myriad villages and hamlets. The information centre is currently open 10am to 4pm Monday to Saturday. By Peter. Last updated Wed 12 Dec 2018 at 7.42pm. Each year everyone turns out for entertainment in the Market Place. Santa arrives and the Christmas Lights are switched on. Almost all of the cost of the lights is raised by volunteers in the Thirsk Business Association Ladies Group. By Peter. Last updated Fri 27 Jul 2018 at 5.02pm. In a poll by Dalesman, Yorkshire's favourite magazine, viewers were asked to name their favourite show either set or made in the county. More than 3,000 votes were cast - and the veterinary drama starring Christopher Timothy and Robert Hardy and filmed largely in the Yorkshire Dales was the runaway winner, taking 7.3 per cent of the overall vote. Actor Christopher Timothy, who played James Herriot expressed delight that the drama had topped the poll - and said he had spoken to people who were considering a remake. He said the long-running series remained much-loved thanks to the man he played on screen, Thirsk vet Alf Wight, who was better known by his pen name James Herriot. The series endured, he told the Dalesman: "Because Alf Wight was first and foremost a great storyteller, bottom line, he told great stories". By Peter. Last updated Wed 11 Jul 2018 at 11.16am. You will have the chance at an open day to look over the the site of Northallerton’s former prison at an open day on Sat 14 Jul. Archaeologists have moved in to undertake final exploration at the site before redevelopment work begins. York Archaeological Trust (YAT) is spending two weeks excavating an area close to the listed buildings and the old courthouse wall. It follows previous digs which uncovered the foundations of the old treadmill and kitchen chimney. They hope to open up the hoardings during this phase of digging so people can watch the work and YAT will be at the open day to talk to local people. Plans for the site are currently on display at the Civic Centre in Northallerton – they include retail, restaurant, cinema, digital hub and public open space. The open day is Sat 14 Jul from 11am to 3pm with last admission 2.30pm. Sturdy shoes are recommended. The excavation area will also be open for informal viewing on Thu and Fri – between 11am and noon and from 1 to 2pm. Entrance and exit is from the Crosby Road side of the site, not from the original gatehouse. By Denise. Last updated Wed 27 Jun 2018 at 5.07pm. On Saturday 30 June Skeldale nurses Rachael, Helen, Zoe, Kate, Emma and Vet, Helen will be taking on the Yorkshire 3 Peaks Challenge in aid of the Alzheimer's Society. They will be walking a total of 26 miles and climbing a total of 5200ft, in this heat! or at Skeldale Veterinary Centre in Thirsk. By Denise. Last updated Wed 20 Jun 2018 at 9.15pm. Bill Calvert, 66, from Thirsk, who has dedicated more than 45 years to serving the town and surrounding communities has been awarded an MBE for services to business, charity and the community. Founding Calverts Carpets back in the early 1970s., Bill is still very much 'front of house' . He employs around 100 people in his shops throughout North Yorkshire and the North East. Over his years in business, he has supported various voluntary groups, community projects and charitable causes throughout towns and villages in the Thirsk area, including the original Thirsk Festival (now revived and held in August each year), donating a piece of land for a public picnic area, helping with the regeneration of the volunteer run Ritz Cinema, Funding a police vehicle for North Yorkshire Police. Since 1986 he has supported his wife Sue in her fundraising efforts for Action Medical Research, which funds medical research for sick and severely disabled children. Bill was amazed, but delighted to receive the award and says he is lucky to live and work in such a wonderful area. By Peter. Last updated Tue 19 Jun 2018 at 1.58pm. To find your way around 'the quaint market town of Thirsk' you need our free guide. The map clearly shows the paths, snickets and ginnels which permeate the town so that you can connect them together to make up your own short walk. It will help you find children's play areas and show you how to escape the built up area on foot in just a few minutes. Wheelchair and pushchair walkers can see how to explore within the town. The Thirsk Guide is available free of charge from the information centre (small donation appreciated) and from many other places in and around the town. If you are not yet in Thirsk send an addressed envelope (DL or A5 size) bearing a 1st or 2nd class stamp to Thirsk Tourist Information, 93A Market Place, Thirsk YO7 1EY. We will post the Thirsk Guide to you by return. A walk around the Blue Plaques is also available (50p) and a longer trail to understand the history of Thirsk and how it became its present day self comes as a booklet (50p) and a downloadable free smartphone app. By Peter. Last updated Sat 5 May 2018 at 5.45pm. The Tour de Yorkshire men's race from Richmond to Scarborough via Bedale, Northallerton and Thirsk passed through Thirsk on Sat 5 May. By Peter. Last updated Tue 19 Dec 2017 at 10.58pm. Last Sunday Thirsk RBL Band played at lunchtime in the Market Place and then in the evening for carols around the tree in Sutton-under-Whitestonecliffe. On Monday they did the same in Carlton Miniott and this evening (Tuesday) the people of Sowerby came out in force to sing carols with the Band at Sowerby Tree (see picture). That's not the end. On Friday the Band will be at the Church of All Saints, Nether Silton at 7pm and on Saturday leading carols on Sandhutton Village Green at 5pm. In between you may come across them at Morrisons Boroughbridge, having already entertained customers of Tesco in Thirsk last week. By Peter. Last updated Sat 11 Nov 2017 at 2.10pm. 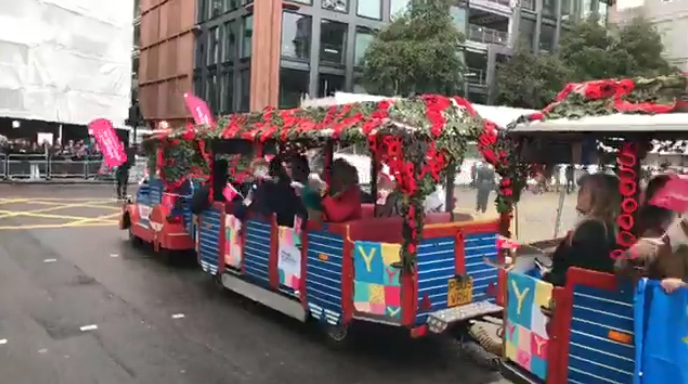 In the Lord Mayor's Show procession today the Thirsk Yarnbombers made a big contribution to the Welcome to Yorkshire display. Here you can see their knitted poppies and other features of the display, such as the Grannies on Trollies. It all draws attention to Yorkshire! By Peter. Last updated Wed 12 Jul 2017 at 9.18am. It is summer! Here is a present that will remind you and your friends. This cotton tea towel, made in England, has a bright white finish and full-colour print with a narrow white border. It is hemmed on all four sides. The size is 48 x 76cm (19 x 30 inches) approx. You can buy it in Thirsk's information centre or online. By Peter. Last updated Sat 22 Oct 2016 at 3.47pm. Congratulations! The Thirsk Yarnbombers have received a North Yorkshire County Council Community Award. You can assist the current project by helping in St Mary's Church most afternoons this week. To donate poppies and other knitted & crochet items please contact the Thirsk Yarnbombers via Facebook at https://www.facebook.com/tyb2016 or bring them into the Thirsk information office. By Peter. Last updated Sun 2 Oct 2016 at 7.07pm. Were you there? Can you find yourself in these pictures taken on 1st May 2016? HERE are 350+ photographs from when the Tour de Yorkshire cycle race passed through Thirsk and then proceeded up Sutton Bank. Copyright Hambleton District Council, used here with permission. By Peter. Last updated Sun 7 Aug 2016 at 10.30am. James Herriot was born on 3rd October 1916 and to celebrate the 100th anniversary Thirsk Yarnbombers have struck again! The Market Place is decorated with all kinds of creations in knitting and crocheting. Here is the Vet, but come to Thirsk and see all the other animals and children's characters. You'll enjoy the day out. James Herriot's veterinary practice is now run by Julian Norton who, with James Herriot's trainee Peter Wright, is star of 'The Yorkshire Vet'. This is a long-running series on Channel 5 and gives a fly-on-the-wall account of a vet's life today. You can see how many things have changed since James Herriot's day, but some of the work is largely unchanged. The next series will start in the Autumn, close to Alf Wight's birthday (that's the real name of James Herriot). By Ted. Last updated Tue 4 Oct 2016 at 8.56pm. One of the Yorkshire vets, Julian Norton, has written his first book, 'Horses, Heifers and Hairy Pigs' which is due out in September. It charts his life and experiences since deciding to become a vet. Sometimes humorous, sometimes sad, warm and compassionate dealing with many varied animals and humans. 'The Yorkshire Vet' is a documentary series following life in James Herriot's former practice and a set of 10 new programmes is now running at 8pm on TV Channel 5. By Peter. Last updated Fri 24 Jun 2016 at 4.07pm. Wednesday 22 June was Thirsk Day at Kings Cross Station in London. Three organisations - Thirsk Tourist Information, The World of James Herriot and Grand Central Trains - presented the delights of a short break in Thirsk away from the Big City from a stand in the middle of the main indoor concourse. You can see photographs of our day HERE. In addition to this, Grand Central Trains' engine 'James Herriot' was re-dedicated in honour of the 100th anniversary of Alf Wight who wrote 'All Creatures Great and Small' and other stories about his life as a country vet in Thirsk. By Peter. Last updated Wed 29 Jun 2016 at 12.46pm. We can help you discover the work of the 300 Thirsk needleworkers who are the Thirsk Yarnbombers. HERE is a map to help you explore Thirsk through their knitting and crocheting. 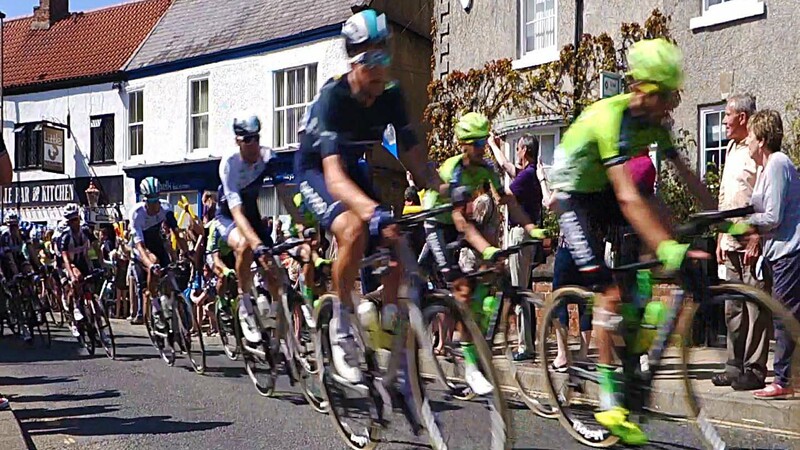 Commented Monsieur Prudhomme, director of the Tour de France and Tour de Yorkshire when he was in Thirsk with Sir Gary Verity last week: "incroyable!" Print the map, preferably on a printer that can do both sides of the paper, then bring it into Thirsk to find the (literally) hundreds of creations like the ones above. Have fun seeking them all. You can also buy a printed copy in the Thirsk information centre either as a souvenir or to help your explorations. By Peter. Last updated Wed 27 Apr 2016 at 5.43pm. Christian Prudhomme, French director of the Tour de France (left) and Sir Gary Verity, head of Welcome to Yorkshire (right), and were in Thirsk today. The former organisation (ASO) is also in charge of the Tour de Yorkshire and other international cycling races. They met children from East Thirsk school at the World of James Herriot, the Thirsk Yarnbombers at Yorks tearooms and the volunteers who run Thirsk's information centre. The Tour de Yorkshire cycle race comes to Thirsk next Sunday on its third day. By Peter. Last updated Tue 23 Feb 2016 at 5.12pm. We have a hand-drawn plan of Thirsk Market Place as it was in 1916 to 1925. To see what shops were available then click here. Note that some, like the three independent butchers, are still serving the people of Thirsk today. By Peter. Last updated Fri 8 Jan 2016 at 6.39pm. By Ted. Last updated Sat 28 Nov 2015 at 8.53pm. Internationally acclaimed artist Norman Ackroyd RA CBE is featured in this month's Artists & Illustrators magazine on the "My Favourite Things" page. When asked to name his favourite art shop he replied (quote) "There's a wonderful little art shop in Thirsk called The Artist's Palette" What a great endorsement! Mr Ackroyd favours Thirsk a lot (Zillah Bell Gallery often have the honour of launching his exhibitions over the Royal Academy) and he loves shopping in our lovely friendly town. Volunteers meet "The Yorkshire Vets"
By Ted. Last updated Wed 18 Nov 2015 at 8.25pm. Thirsk Information Centre volunteers are pictured here with “The Yorkshire Vets” at their recent triumphant visit to the Leeds Arena. They were presented with the Visitor Information Award, (sponsored by BBC Yorkshire), at the Welcome to Yorkshire White Rose Awards on Monday 9th November 2015. As can be seen the volunteers also met “The Yorkshire Vets”, Julian Norton and Peter Wright, who informed them that a further two series are being prepared as a result of the success of the first, six-part series. Look out for the series on your home television services in the future as it is sure to be exported, as happened with the original James Herriot “All Creatures Great and Small” TV series. By Peter. Last updated Tue 17 Nov 2015 at 9.09pm. William Towler Kingsley 1815 to 1916, former rector of South Kilvington, was once a famous figure in the Thirsk area. Friends with Turner and Ruskin; an extraordinary polymath whose talents and interests embraced geology, gardening, photography, drawing, astronomy, organ building and wood carving, he is now almost forgotten. After years of research, Helen Crawford has written a booklet outlining his interesting life, including such unforgettable episodes as the failure to discover Neptune thanks to a cup of tea; and the unhappy death of a prostitute in Cambridge which led to William being labelled a murderer by the newspapers. From every sale, one pound is donated to the fund for the restoration of St. Wilfrid's, South Kilvington, Thirsk. Email for details. By Ted. Last updated Tue 17 Nov 2015 at 9.14pm. From the Yorkshire Post today Monday 16th November: Mr Dan Aldred, Thirsk Schools Head of Computing, inspired a group of his pupils. As a result they won a national competition and were chosen to send computer code to the International Space Staion which prompts it to displays the national flag of the countries it is flying over. As a result he has been chosen to appear in "Your Future Their Future" campaign by the National College of Teaching and Leadership (NCTI) to recruit new teachers into the profession. By Peter. Last updated Tue 10 Nov 2015 at 1.22am. The thirty volunteers who operate Thirsk Tourist Information were surprised and delighted to be awarded the Visitor Information Award, sponsored by BBC Yorkshire, at the Welcome to Yorkshire White Rose Awards on Monday. The award follows five seasons of growth since Thirsk Tourist Information became independent of Hambleton District Council in April 2011. Harry Gration from BBC Look North presenting the award to Peter Rush said: “And what's amazing, they are all volunteers“. We are a welcoming group of volunteers with a wealth of knowledge and a passion for Thirsk and the surrounding region. We are currently open Mon-Sat 10am-4pm. By Peter. Last updated Mon 4 May 2015 at 9.25pm. "Walking face on to the scented breeze, I felt the old tingle of wonder at being alone on the wide moorland where nothing stirred and the spreading miles of purple blossom and green turf reached away until it met the hazy blue of the sky." James Herriot in 'Vet in Harness'. James Herriot lived in Thirsk. He wrote 'All Creatures Great and Small' and many other books about his life as a country vet in Thirsk, which he called Darrowby. Thirsk is between the North Yorks Moors and the Yorkshire Dales so is an ideal place from which to explore both. What's more, in Thirsk you can visit the 'World of James Herriot', housed where he worked and lived. By Peter. Last updated Sat 28 Mar 2015 at 3.27pm. 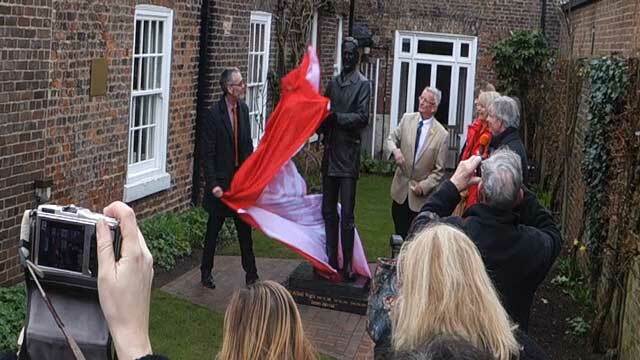 Ian Ashton, manager of The World of James Herriot introduces James Berresford, CEO of VisitEngland who unveils the statue of Alf Wight (aka James Herriot). Then Jim Wight, a vet like his father, tells what it was like living with a budding author. By Peter. Last updated Wed 30 Apr 2014 at 8.57pm. Free WiFi is now available in Thirsk Market Place. To log in, connect to 'Thirsk Free WiFi'. A few seconds later on a tablet or smartphone a notification to complete the WiFi connection might appear, otherwise open the browser. Accept the Terms & Conditions, complete a simple form and you are connected. The free WiFi is a collaboration between Telecom Yorkshire, Thirsk Tourist Information, Hambleton District Council and the Thirsk Business Association. It is being provided at almost no cost to the ratepayers. In addition, many of the Market Place shops and coffee bars provide free WiFi. By Peter. Last updated Sun 24 Jul 2016 at 8.20am. The view over the Vale of York from the top of Sutton Bank was loved by Alf Wight, the James Herriot of 'All Creatures Great and Small' and other books about his life as a country vet. At this time of year in Winter you can see the multiple shades of green and purple. By john. Last updated Wed 13 Nov 2013 at 9.42am. Its now official, Yorkshire is one of the best destinations in the world for tourists. Endorsements rarely come much better than this, from a guide that has a worldwide reputation across tourism and informing visitors. Listing the county as one of the best regions in the world for visitors in the coming year is in recognition of it being a fantastic all-rounder: with some of the most stunning scenery in the country, dynamic cities, friendly people and a burgeonning food scene. By Peter. Last updated Fri 5 Jun 2015 at 9.36pm. visitors to Thirsk and for local residents. It gives you vital information in planning a day out. Included are the weather forecast from the BBC and a snapshot of Thirsk Market Place. Both are less than an hour old whenever the newspaper is printed. Following the weather and picture are two articles about fascinating places to visit. These articles change so that you will see new interesting stories every day. Lastly there is a list of events happening today and, if there is space, some events for tomorrow. If you will be travelling to North Yorkshire please print the newspaper in the days before you come. Click HERE to see the latest edition of Thirsk Morning, produced less than an hour ago. Please print the sheet rather than viewing it online. By Peter. Last updated Thu 28 Feb 2013 at 4.59pm. In 1930 Thirsk organised a 'Shopping Week' to promote local businesses. At TTI we are helping with 2013's promotions. In 1930 the equivalent of this website was a booklet you will find HERE and the following is a taster from it. We have different events now but things don't change too much in Thirsk! Saturday, May 31st, 2 p.m. Opening speech by T. J. Lynch, Esq., Chairman of the Thirsk Parish Council. Spotting and Error Hunting begins. The Thirsk & Sowerby Prize Band will give two Concerts in the Market Place, at 2-4 p.m. and 6-9 p.m.
Monday, June 2nd. Spotting and Hunting will be in full swing. Display judging by the public should take place,and entries sent in for the Safety First Driving Competition. Tuesday, June 3th. Spotting and Hunting continues. In the evening the Safety First Driving Competition will commence at 6-30 p.m., from the Market Place, and continue for several hours. Be there to see the starters, and watch for the finishers. Wednesday, June 4th. The Athletic Club are co-operating with the Chamber of Trade in arranging a pleasant time at the Athletic Club Ground. A Special Cricket Match between Thirsk 1st and York Revellers, will take piace in the afternoon. Tea will be served in the grounds. In the evening the T. & S. P. S. B. will play Dance Music. Tell us something you know about Thirsk, perhaps local history, your visit, an activity here or a forthcoming event. Please send a picture if you have one.